NASA has officially set a May 16 launch date for the space shuttle Endeavour after more than a week of repairs to once again ready the spaceship for what will be the second-to-last mission of the agency's 30-year shuttle program. 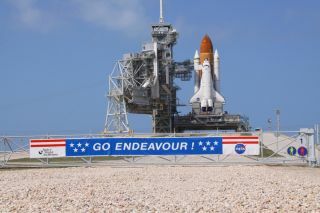 Endeavour is now scheduled to lift off from NASA's Kennedy Space Center in Cape Canaveral, Fla., next Monday at 8:56 a.m. EDT (1256 GMT). NASA called off an earlier launch attempt on April 29 when technicians discovered that two heaters protecting a critical power unit had failed. Subsequent tests traced the problem to a switchbox that powers the heaters. Engineers have since removed the suspect box, called a load control assembly, and replaced it with a new one. They also replaced about 20 feet (6 meters) of wiring leading to and from the switchbox. "Right now we're in good shape, Endeavour's looking good," shuttle launch director Mike Leinbach said today (May 9) in a press conference. "Hopefully this time the heaters will work and we'll be able to launch on time Monday morning." "The failure on launch date was a failure of having power supplied to the heaters," said Mike Moses, chair of the mission management team. "The cause of that failure to supply power, we're still not exactly sure of." Nonetheless, the team knows enough for now to commit to a new launch date, Moses said. "We have extremely high confidence that the problem is no longer on the ship," he added. Endeavour will carry six astronauts to the International Space Station to deliver a new $2 billion astrophysics experiment that will study dark matter and other mysteries of the universe. The shuttle will also haul up a load of spare supplies for the orbiting laboratory. Four spacewalks are planned. The shuttle's veteran crew will be led by commander Mark Kelly, whose wife, Congresswoman Gabrielle Giffords, is recovering after being shot in the head in January. Giffords had traveled to Florida from her rehabilitation hospital in Houston for the April 29 launch attempt, but it's uncertain whether she'll be able to make the trip back for the next liftoff date on May 16. Kelly and the other shuttle Endeavour astronauts will arrive in Florida on May 12 to begin preparing for their launch. After this mission, Endeavour's 35th and final spaceflight, NASA plans only one more space shuttle launch. The shuttle Atlantis was scheduled to launch on June 28, but given the delay with Endeavour, Atlantis' launch date will also slip, Moses said. Mission managers estimate they will have to delay Atlantis' STS-135 liftoff by about two weeks. "I'm really sorry, but we cannot estimate that 135 date," Moses said. "We're looking at the second week of July." After the space shuttles fly their final missions, NASA's three shuttle orbiters — Endeavour, Atlantis and Discovery — will be retired to museums.